ISLE OF WIGHT FESTIVAL- LOCALS ADD TO THE MAGIC. 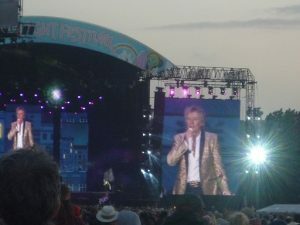 Sir Rod Stewart on stage at Seaclose Park, Newport. Island charities and organisations were able to display their wares and greet visitors from a new venue within Seaclose Park at this year’s IW Festival. Situated near the ‘Green’ entrance this area was also home to island based Platform 1 Music College. 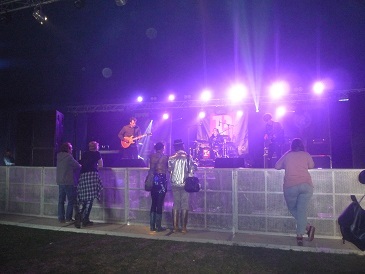 Housed in a large red ‘mini top’ the stage and audience area was ideal for the bands and performers to entertain their fans. With 41 acts over the weekend this out- numbered the acts on the IW Festival main stage, where one of the Platform 1 bands were given a slot. Speaking with Dave Pontin Principal of Platform 1 he said that he hoped that the members of Scouting for Girls would catch up with the Platform 1 team as they had worked with them in the past. Near the Platform 1 ‘mini top’ the stand for Scouting for girls and boys- Isle of Wight Scout Association- were on hand with activities and information on Scouting. John Giddings, (‘Mr. 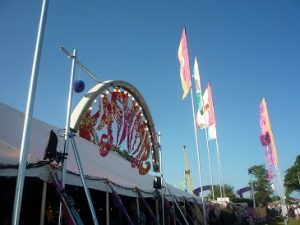 IW Festival’) is now an ambassador for IW Scouts having been a Scout leader in Hertfordshire in the past. Across from IW Scouts the Dimbola stand was as popular as ever with displays of past IW Festivals including the 1970 event held a stone’s throw from Dimbola. At Dimbola Museum and Galleries, Freshwater Bay a refurbished IW Festival exhibition is now on display and will continue to be a feature in one of the galleries. This exhibition space is supported by John Giddings. 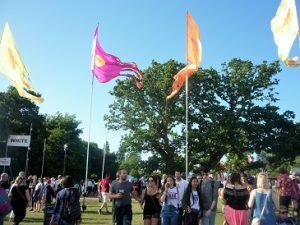 Away from this area Kashmir Café, organised by Quay Arts, once again proved a popular venue for festival goers. Several Isle of Wight performers were included in the playlist and there was a guest appearance of Wheatus which not only filled the marquee to beyond capacity but the crowd hoping to see a performance of the band’s ‘Teenage Dirtbag’ spilled outside. Several visitors headed to Kashmir Café for the IW produced craft beers as well as listening to home-produced music. At least two Island businesses were housed in The Octopus’ Garden area of the festival with Mermaid Gin offered as one of the gins to accompany Fever Tree and nearby the Garlic Farm had their usual goods and flavour on offer. Away from the main arena a number of Islanders took part in the variety of entertainments on offer, including carnival skills and other performing arts. One of the bigger areas was that of British Airways. With cabin crew on hand to aid the punters there were competitions to win BA flights, a relaxing bar, DJ stage and children’s activities, all accessed by a very slippery baggage shute. Entrance to the Festival could have been better for those first attending on Friday. At 6pm there was a 2 hour wait for those trying to access at Medina College. Long zig-zag queues formed in the point of access near Medina College and continued back towards Newport. Six deep in places across the pavement width this queue stretched back at times almost to the next entrance at Seaclose Park. On the advice of the Police, some members of the public walked on to the camping entrance but others gave up, missing the Friday evening acts and travelling back home or to other accommodation on the Island.